When it comes to dinner shows, Kissimmee and Orlando have got a large variety of shows to offer to keep the whole family entertained. Some shows will have special packages with unlimited drinks, including beer, wine etc. Some shows feature á la carte menu's, some will feature unlimited pizza's, popcorn etc. Hint: Visit the websites of these dinner shows to find discounts. They can get up to 50% off! If you can't find any good discounts on their own website, try Maple Leaf Tickets! Knock three times, give the secret password and discover the mysterious world of 1931 gangland Chicago. Our new show delivers loads of laughs, gangster action, audience interaction and toe-tapping musical productions. Fun for all ages….it’s a blast! Includes a dinner buffet, unlimited cocktails and dessert. 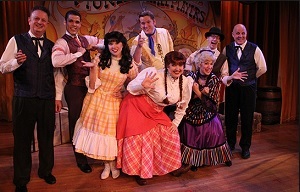 Frontier-Style Family Fun, join the Pioneer Hall Players for 2 hours of rousing Wild West dancing, singing and zany vaudeville comedy. You never know what to expect when Claire de Lune, Johnny Ringo, Dolly Drew, Six Bits Slocum, Flora Long and Jim Handy hit the stage. But you do know that it’s not going to be dull! Get ready to clap your hands, stomp your feet, sing along and have a good ol’ time at rustic Pioneer Hall in Disney’s Fort Wilderness Resort & Campground. In between skits and song standards, chow down on buckets of all-you-care-to-enjoy fried chicken and smoked BBQ pork ribs, as well as a tossed green salad, baked beans, fresh-baked cornbread and strawberry shortcake. Celebrate the spirit of aloha with spellbinding dancers, drummers and a show-stopping fire-knife performer. Auntie Wini is hosting a fun-filled luau to welcome home one of the local girls who has been living on the “mainland”—and you’re invited! Settle in for platters of authentic dishes, like barbecued ribs, rotisserie chicken and fried rice. You can also savor fresh salad with a mango-poppy seed dressing, seasonal vegetables, sweet bread and golden pineapple. Polish it all off with a Kilauea chocolate volcano! Children’s favorites like PB&J sandwiches, hot dogs and macaroni-and-cheese are also available on the limited kids menu. All-you-care-to-enjoy food and drinks. Medieval Times Dinner Theater is home to an adventure unlike anything you have ever experienced before. During each live performance at Medieval Times, guests of our castle enjoy an authentic medieval feast while brave knights on horseback do battle to the death. During this death defying show, each section of the arena will be represented by a brave knight fighting for their colored seats. Cheer and support your knight to victory and the heart of the princess as they compete in various events throughout the show. 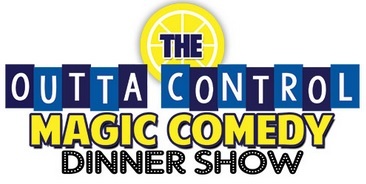 This hysterical and one-of-a-kind entertainment dinner show combines high-energy comedy improvisation with awesome magic, music and illusions for families of all ages. Guests become part of the experience with non-stop audience participation. This 90 minute experience is full of non-stop laughs are performed by nationally recognized entertainers Tony Brent, Fred and Adina Moore nightly. In addition, more than 150 guests have the chance to play an actual role in each show as the evil Captain Sebastian the Black leads his crews of renegades on a swashbuckling adventure before your very eyes! Sleuths Mystery Dinner Show has been providing an exciting and intellectually stimulating form of entertainment in Orlando, Florida for over 23 years. An evening at Sleuth's begins with you being treated as a guest at a celebration such as a wedding or class reunion depending on which of our 11 plays you attend. Over salad, hors d'oeuvres and drinks you will begin to get acquainted with the characters of the show and will learn more about their situation during the 30-45 minute play at the end of which, of course, one of them dies. After the murder, everyone is hungry so you can discuss clues and theories over dinner. Be sure to come up with some good questions because after dinner we bring all the characters back on stage (the ones that are still alive anyway) and allow you to interrogate them for more information. The dramatic unveiling follows dessert. Sleuth's Mystery Dinner Show will keep you entertained until the very end. 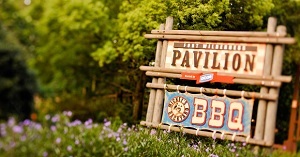 Scoot on down to this covered, open-air pavilion for a music-filled hoedown with some favorite Disney Characters.Feast on an all-you-care-to-enjoy BBQ spread to cowboy rope tricks and the rootin’ tootin’ tunes of a live country-western band. Then mosey on over to the dance floor for line dancing led by Disney Friends! Several times throughout the night, Disney Characters make the rounds to mingle with Guests at their tables for photos and autographs. Cowpokes may meet: Mickey Mouse, Minnie Mouse, Goofy and Chip 'n Dale. Character appearances and entertainment are subject to change. This neighborly, all-you-care-to-enjoy BBQ picnic features mouth-watering country favorites. Feast on barbeque ribs, smoked chicken, hamburgers, hot dogs with all the trimmings, corn on the cob, macaroni and cheese and more. Quench your thirst with lemonade, fruit punch and soft drinks, plus complimentary wine and beer for guests 21 years of age and over. 4510 North Fort Wilderness Trail, Typhoon Lagoon Access Rd. 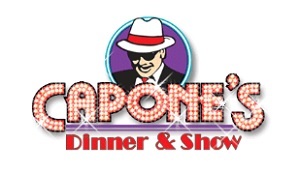 Orlando's Hottest Nighttime Show & Dining Experience! 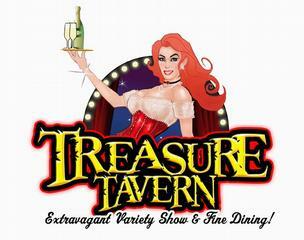 Step into an evening of extravagant amusement and exceptional dining with Treasure Tavern. Meet Madame Gretta the tavern's outlandish maven who escorts guests through a two hour show filled with excitement, fun and a four course dinner and find out why travelers, adventurers and explorers call this tavern the best place for entertainment, dining and rum!